Michigan, once considered a pioneer in recycling, now has one of the worst rates among Great Lakes states. About 15 percent of its solid waste is recycled, compared to 35 percent nationwide. LANSING — Michigan was once a recycling pioneer. In 1978, it became the first big industrialized state to implement a deposit law for bottles and cans. The 10-cent deposit was meant to keeping the containers from going to landfills or worse — rolling along highways and streets. Four decades later, the deposit policy — etched into pop culture through a 1996 episode of “Seinfeld” — is a hands-down success. But the state’s broader track record on recycling stinks, according to most everyone following the issue. That means more of the state’s waste goes on to fester in landfills, where it might pollute water if not properly monitored and even help speed climate change. (Decomposing garbage sends heat-trapping methane into the atmosphere. Municipal landfills are the nation’s third-largest source of human-induced methane emissions, according to the U.S. Environmental Protection Agency.). Gov. Rick Snyder has spent years unsuccessfully trying to increase recycling. He wants to raise fees to support recycling programs and increase the state’s rate, 15 percent, which is well below the national average of nearly 35 percent, according to the U.S. Environmental Protection Agency. What happened? How did Michigan fall behind, and what are some lawmakers trying to do to reverse course? Here are seven things to know. Michigan’s redemption rate on eligible containers consistently hovers well above 90 percent, and residents reclaimed more than $10.4 billion of about $10.8 billion paid in deposits from 1990 through 2016. Two months ago, state Rep. Jon Hoadley, D-Kalamazoo, introduced legislation that would expand the deposit law to water and juice bottles. The bill has yet to receive a hearing. But containers with deposits make up a small fraction of the recyclable waste people toss — cardboard, various types of paper, plastic bags and packaging and textiles, to name a few. Michigan is considered worst recycler in the Great Lakes region and “clearly in the bottom portion of the country,” says Sean Hammond, deputy policy director for the Michigan Environmental Council, a Lansing-based advocacy group. National rankings aren’t available because because methodologies vary, and some states don’t collect such data at all, according to the EPA and reports from other experts. 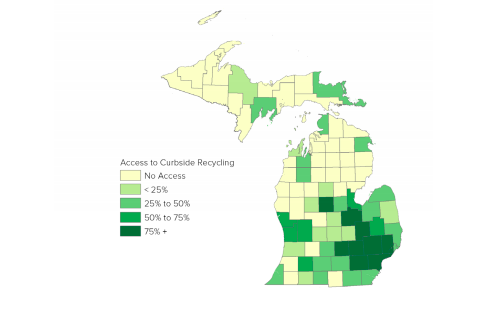 Michigan only recently began collecting broader data on recycling. Nationally, the rate of recycling has more than doubled in the past 30 years, according to the EPA. Michiganders sent nearly 12.6 million tons of solid waste to in-state landfills in 2017 alone. The landfills are among the country’s cheapest to use. That “makes it extraordinarily easy to throw something away instead of recycling it,” Hammond says. Landfill proposals at the time were often highly controversial, drawing opposition from environmentalists and even county officials, but state environmental regulators continued to greenlight them. With so much extra space, dumping prices plunged. Rather than encouraging reuse and recycling, state law required counties to maintain a certain amount of landfill capacity. Low landfill prices made Michigan a prime dumping spot for other states — and Canada. More than a quarter of waste sent to Michigan landfills in 2017 came from outside the state, and 82 percent of the imports came from Canada, according to a Michigan Department of Environmental Quality report. While Michigan has made landfill dumping easier, it’s done little to help communities invest in recycling. 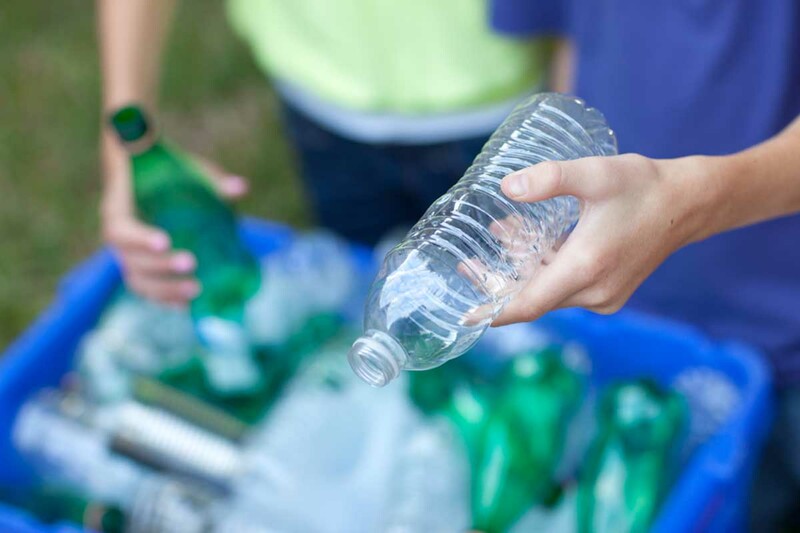 Just 67 percent of Michiganders had access to curbside recycling or a convenient drop off facility as recently as 2013, according to a survey by the Michigan Department of Environmental Quality. Some counties, particularly in stretches of the Upper Peninsula and northern Michigan, had virtually no convenient access. Experts say a few local Michigan governments that have taken initiative: Emmet County, at the tip of the Mitten, is a rare rural success story, having run successful curbside and drop-off recycling programs for years. But Emmet County is one of the wealthiest in Michigan, and most counties don’t have the money and expertise to invest in recycling. Neither local governments nor the DEQ have received state funds to rewrite waste management plans — whether on the landfill or recycling side — since the late 1990s, according to a 2017 report from he Michigan Solid Waste and Sustainability Advisory Panel, which Snyder assembled to propose an overhaul of the state’s waste disposal laws. That means recycling practices are often stuck in the past. Since state funding dried up in the 1990s, “local expertise went away. I would say maybe a dozen counties have done any plan updates since the early 2000s,” said Hammond. And most of those updates were geared around landfills rather than recycling. “We’re really not going to make headway on recycling in Michigan without creating a major local funding source,” Garfield said. Emmet County, for instance, funds its recycling effort by selling recycled materials and through fees on private waste haulers and folks using the program. Recyclers also operate at the whims of a global market, and commodity prices fluctuate month-to-month. Recyclers have recently struggled to fetch good prices for a litany of products, including cardboard and plastics. The market for glass is particularly rough, causing some communities — including the University of Michigan — to stop collecting it for recycling. Michigan charges a 36 cent “tipping fee” on each ton of waste disposed of in its landfills. That’s far lower than other Great Lakes states. Snyder wants to increase the fee to $4.75 per ton, matching Ohio’s rate. Snyder has proposed using most of that money for toxic cleanups. But he would put some $15 million towards his recycling goals. Most of the recycling money would be doled out to counties through planning grants for education, building recycling centers and buying equipment and marketing sales of recycled material. Snyder’s advisory panel — comprised of environmentalists, industry representatives, local officials and others — is working on wide-ranging legislation to make state law less deferential to landfills and more friendly to recycling. Among other provisions, the proposal will likely include funding and other incentives for counties that set and reach recycling goals, said Hammond, a panel member. “This is kind of a fresher focus on recycling than we’ve ever seen, said Hammond, who hopes to see the legislation introduced by the end of April. The bills would face an uncertain future. Hammond said he believes legislation has a chance to reach Snyder’s desk. But recycling requires money, and any reforms would require buy-in from a Republican-controlled Legislature often reluctant to raise taxes or fees. Well .... rather than toss around questionable stats, why don't the environmentalists get return deposits for water and juice bottles put on the ballot? Oh wait theyre too busy trying shut down pipelines and force windmills down our throats to spend time on mundane items. Or are you folks at Internet Research Agency (or whatever troll farm you inhabit) just focused on widening divisions in America? Actually I used to (probably more of a old fashioned conservationist) but now find that environmentalism has morphed into some kind of Animistic Neo-Marxism which seeks to kill the prosperity that allows us to effectively address real environmental problems. And yes seriously, I pick up more than my share of trash, so I'd like to see that measure or similar put on the ballot, even though I question the meaning of the stats that this article purports. What is disappointing is that you so easily distain someone with a different perspective as being the antitheist of an 'environmentalist'. There are many people that have been actively recycling before there were deposit laws when an aluminum can was a penny, or taking scrap metal and newspapers to the scrap dealers or going to the junk yards to reuse parts off of damaged cars, or at work making the facilities more energy efficient, reducing waste by making conversions more effective. The reality is that 'environmentalists', 'greenie', and other such contrive names or phrases are for political power not improving the environment. Matt is correct if all that energy spent on shutting down #5 were investing in identifying risks and addressing those risks the Line would be made safer and it could become a model for other such pipelines making the rest of the Great Lakes more secure. A question for you, is it more environmentally responsible to use non-renewable materials such as rare earth metals [lithium in batteries] to replace the internal combustion engine or to develop renewable organics [such as the algae in Lake Erie] to run the internal combustion engines? was it better to discourage the use of paper and replace it with plastics? Do 'environmentalists'/'greenies' consider the energy consumption for a windmill from 'cradle to grave' or do simply look at it in a convenient moment? Rather than personally attack those they disagree with, the 'environmentalists' would do better to engage others in conversations, listening and responding. You pick a persistent problem [be specific] and I expect that you, me, and Matt could come up with an innovative approach to solving it, one worth trying. Reality has shown that a diversity of perspectives generates more creative approaches to problems than people that all have the same prespective. When you have conversations and listen to people with different perspectives you have to pause and look up to see what they see and find you look at things a bit differently and that helps you think a little differently. "Two months ago, state Rep. Jon Hoadley, D-Kalamazoo, introduced legislation that would expand the deposit law to water and juice bottles. The bill has yet to receive a hearing." This has been proposed multiple times in Michigan, and has never been passed. Bottling companies, grocers, and others have joined forces to defeat these bills over and over again. I agree that such legislation is needed. I am a cyclist and as I ride I see very few pop or beer containers along the roads. Bottles from sports drinks, water, lemonade, tea, etc., however, are all over the place. But store owners do have a point in terms of the cost of the additional facilities needed to accept and store the huge volume of additional containers that they would have to deal with. It is not as simple as merely passing legislation and then saying "problem solved." There is currently a bill heading for vote that would eliminate the deposit law. The brain behind this bill says it will promote more community recycling. He must not remember what our state looked like before deposit law. Michigan is now fallen down on recycling. How can someone think getting rid of the deposit law is going to help. You give a whole new meaning to the term "Fossil Fuel". Lansing has free curbside recycling with no money charged for the bin, it appears to be a success, they come by every other week to empty it. If there was a charge I'm sure the participation rate would be much less. Thank you again to the Tea Party for leading us to the bottom of the barrel. Are you really this stupid or is this just an act? WHAT, Matt? "Two months ago, state Rep. Jon Hoadley, D-Kalamazoo, introduced legislation that would expand the deposit law to water and juice bottles. The bill has yet to receive a hearing." Attorney General Bill Schuette is a Republican, and last year said "A specific and definite timetable to close Line 5 under the Straits should be established." (FREEP article I can't get to link. Google it). This is one more example of the lack of competent leadership in Lansing. Leadership is all about seeing and creating a brighter and better future. It’s about inventing, innovating, creating, building, improving, and transforming education, healthcare, business, government, technology, and every aspect of our lives and the world we live in. Lack of leadership in Lansing leaves MI at the bottom of the pack in all quality of life indicators for the majority population. Our children and grandchildren will not stay in MI when the opportunities to work with competent leadership does not exist here. If we only look to Lansing for leadership we will always be disappointed. There role is not creating, not innovation, not technological knowledge and skills, it is simply to get elect, if it were other than that the electorate would a have set of knowledge and skill and performance expectation that all would be held to. My best guest is you don't have any such expectation that you can describe for others to use, and you are just like almost all voter [myself included]. If we want more recycling, if we want people aggressively recycling, if we want more recyclable materials use that we need to describe the expectations, establish performance metric, encouragement/feedback/incentives to give people reason/desire to recycle. What might be is for people to start by sharing their reasons to recycle, the means the recycle. As an example, I recycle because I distain purposeful waste. We recycle in three ways were try in three ways; find a second or third use before seeing it go to trash plastic grocery bags for garbage collection before going in the trash], we participate in the recycling through our City [we use to take materials directly to the recycling center], we help with recycling others materials [working at a Habitat Restore deconstructing donated items that can't be sold for the scrap metals or weave salvage, used clothes into rugs. This was also the same approach of a former employer and added specific goals/incentives/recognition for such activities, that employer has over a hundred years of the culture. None of this was driven by Lansing it was individuals and private companies do, looking at themselves to see what they could not expecting others to do it for them. “The bill has yet to receive a hearing.” I wish Bridge would do a story about the rules our state house and senate operate under that essentially allow committee chairs to become dictators over deciding what moves forward and what doesn’t. If you wonder where our democratic process has failed, start with the rules our representatives operate under. Michigan, at least in the community I live in, makes it very easy to recycle. The single source or every thing in one bin method is far far better than the rules in my winter state which is corrugated cardboard and newsprint in the red bin and bottles with necks only or cans in the blue bin. Here we can put yogurt containers, plastic bags, cereal boxes, cans, and a multitude of other things in the single large bin. What is unknown is whether or not all this waste actually gets recycled. Only the market and the laws of supply and demand determine whether that happens or not. Some of the end goals are laudable (i.e. less waste)...but then the author ruins his entire piece in two areas. One, thinking that charging people more will have a positive effect rather than a negative one . All you've accomplished here is making people mad and given them reason to undo what you have done. Finding ways to make using recycled materials more financially advantageous will win over more people, thereby insuring your success. Two, using this worn-out line,"...and even help speed climate change." Obviously, Mr. Malewitz will inform readers of exactly when the planet's climate HASN'T changed. Or are we to believe that it was always 72° and partly cloudy? The 36cent tipping fee says it all. Why would the waste hauler send a second truck to pick up the recycling and then have to sort it at the recycling center when they can "Tip It" $1 for three tons? I've seen them do it over and over. Recycle goes for cheap and they stop recycling. If they have to pay $5 a ton to get rid, then the consumer and business have to pay which gives incentive to sort at the source. Also needed is an incentive to use the recycled waste. Plastic can be used to make asphalt and there's enough to fill potholes 24/7. Some thoughts on tomorrow's Earth Day. If we as a society don't get a handle on our use of plastic, it's estimated by 2050 that there will be more plastic in all our oceans, lakes and streams than fish. That Scary. Here's some thing more to ponder. Each year we US citizens throw away 100 million cell phone, 20 million TV's and over 41 million computers. Want to take a guess on how many are recycled. EPA estimates 29 percent. Where do you think the other 71 percent goes. EPA states that for every million cell phones recycled, 35,274 lbs. of copper, 772 lbs. of silver, 75 lbs. of gold and 33 lbs. of palladium can be recovered. I've said this before and it's worth repeating, "we are a society of convenience".